During 2010, there is no let up by the government of PRC. As of 30 December 2010, there are 831 known political prisoners in Tibet out of which 360 are known to have been legally convicted by courts and 12 Tibetans are serving life imprisonment term. During the year, 188 known Tibetans have been arrested and detained, out of which 71 have already been sentenced by the courts. The crackdown on intellectuals and cultural figures continued to take place this year also. Since 2008, over 60 Tibetan writers, bloggers, intellectuals and cultural figures have been arrested. The authorities targeted prominent Tibetan figures during the year who were earlier looked upon as exemplary individuals. On 23 August 2010, the Chinese government made an announcement of reforms being carried out in the application of death penalty by removing the capital punishment for financial crimes. Although this reform is welcome, it does not have any significant effect in Tibet. Since spring 2008, nine Tibetans have been sentenced to death with two already having been executed. The remaining seven are serving death penalty with two years reprieve. This year three Tibetans, Sonam Tsering, Lama Lhaka and Sodor of Kolu Monastery in Chamdo were given death sentence with two years reprieve. In May this year, China issued new regulations saying evidence obtained illegally through torture cannot be used in death penalty cases and other criminal prosecutions. China theoretically banned torture in 1996 but evidence obtained through duress was routinely accepted as the definition of illegal acts was vague that police used various techniques to work around the ban. In restive regions like Tibet, torture is a regular feature in the detention centres and prisons. The police use inhumane techniques and torture to present evidence before the courts. During the year students in Tibet staged protests on several occasions in order to put forward their grievances and concerns over social and policy issues. 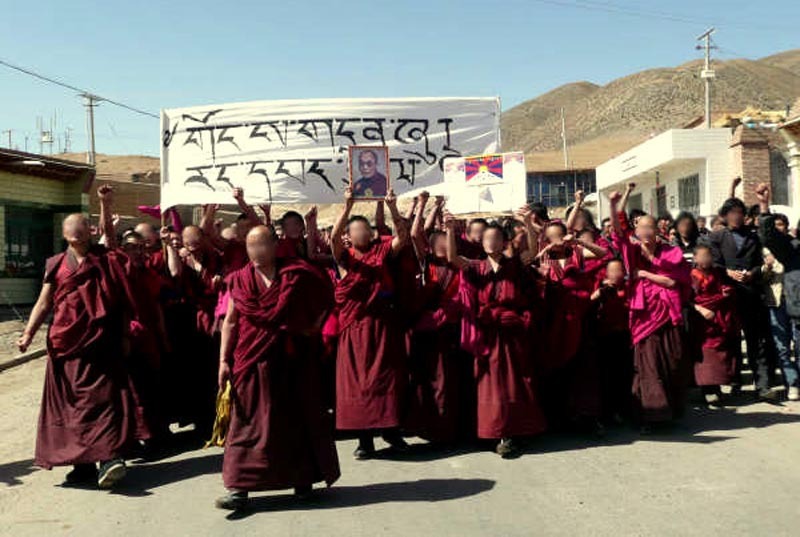 March and April 2010 saw a huge number of detentions and expulsions of Tibetan students and teachers from schools and academic institutions in eastern Tibet. On 19 October 2010, thousands of Tibetan students from six different schools in Rebkong (Ch: Tongren) County, Malho "Tibetan Autonomous Prefecture" ("TAP") in Qinghai, took to the streets to protest against the proposed changes in education system which intends to drastically sideline Tibetan language. The protests later spread to other areas in Tibet and as far away as in the Minzu (Nationalities) University in Beijing where around 600 Tibetan students on 22 October 2010 demonstrated for the protection of Tibetan language. The protests were sparked by an order by the Qinghai government that all lessons and textbooks should be in Chinese language in primary schools by 2015 except Tibetan and English language classes. The government argued that the proposal of enforcing Mandarin in schools will bring the Tibetan students on par with the other citizens, avail opportunities in the economic life and integrate into the broader Chinese society. However, the Tibetans have been calling for the preservation of Tibetan language as an identity of the Tibetan race and the foundation of religion and culture which connects to the wider issue of cultural and ethnic identity. Unfortunately the authorities see the assertion and promotion of cultural uniqueness and pride as anti-state. The enforcement of mandarin as the first language will soon be applied across Tibet which will negatively impact the lives of Tibetans dramatically. China's laws protect and promote ethnic minority languages, however, the reality suggest otherwise. In light of China's constitution, national and international laws, the state of PRC has the responsibility protect the Tibetan language. The proposed change in the education system by the regional government of Qinghai absolutely contradicts all the legal provisions. During the year, practice of centuries old traditional Tibetan Buddhism and the monastic community faced yet another strike by the Chinese Communist Party (CCP) and the government. In September 2010 the State Administration for Religious Affairs (SARA) issued Order no 8 - ‘Management measure for Tibetan Buddhist monasteries and temples'. The 44 articles regulation which entered into force on 1 November 2010 obstructs the centuries old traditional Tibetan Buddhist practices, restricts relationship between students and masters, and provides a strong legal instrument for the authorities to control the monastic institutions as well as monks and nuns. This regulation is a reinforcement legal instrument to curb primarily the influence of the Dalai Lama and other heads of Tibetan Buddhism most of whom live in exile pursuing their religious propagation and teachings. In what can be construed as an escalation of control in the monastic institutions in Tibet, the United Front Work Department (UFWD) of the CCP conducted a meeting on the democratic management of the monastic institutions from 14 - 15 August 2010. The meeting held at Shigatse drew heads of monastic institutions and local UFWD heads in the "TAR" as well as Tibetan areas in four provinces to tighten religious institutions in Tibetan areas. During the meeting, the head of the UFWD, Du Qingli, remarked that patriotic and legal education should be strengthened in order to make the monks and and nuns abide by the laws of the country and voluntarily protect unity of nation, nationalities and social stability. Beijing's discourse on Tibet always had two strands, one that of "development" and "stability" on the other hand. With over 80 percent of Tibetans living in rural areas, the benefits of Western Development Strategy (WDS) have not been accessible to the large majority of ethnic rural Tibetans. Little of the development money has trickled down to the poorest sections of the society. While China claims to prioritize economic rights of its people, it has failed to employ rights based and need based approach to development in Tibet thus rendering extreme difficulties in the lives of nomads and farmers. In drawing his conclusion on the government's resettlement of Tibetan nomads in huge numbers under the Tuimu Huancao (removing animals to grow grass) policy, the UN Special Rapporteur on the Right to Food, Olivier De Schutter, after his mission to the PRC from 15-23 December told the government that nomads should not be forced to sell off their livestock and resettle. After a decade since the last work forum, the Fifth Tibet Work Forum was held in Beijing from 18-20 January 2010. President Hu Jintao and more than 300 of China's most senior Party, government and military leaders attended the meeting. In an unprecedented development, unlike previous four work forums on Tibet the Fifth included all Tibetan areas incorporated into Sichuan, Qinghai, Gansu and Yunnan provinces. Although not much is known, the forum indicated the regional integration of policies across all Tibetan areas of the PRC. After a decade of the ambitious Western Development Strategy, the authorities seem to have acknowledged that the inequality between the rich and the poor has widened, social services are not uniform and the education level of the people uneven. The Fifth Tibet Work Forum indicated to be focusing on accomplishing improvements in rural Tibetans livelihood. Unlike past forums, the work forum did not reveal megaprojects lists although it may well be because the high expenditure projects will be announced in the 12th Five Year Plan for the years 2011 to 2016. During the year thousands of lives were lost to the earthquake in Kyegudo (Ch: Jyekundo) and the mudslide disaster in Drugchu. While it is commendable that the government provided good support in the relief efforts for quake struck Kyegudo, it is unfortunate that the state did not allow the Dalai Lama to the area despite his direct request for a visit to the area to say prayers and console the grieving families. The government would have won much admiration by the Tibetan people as well as internationally had it set aside politics and let the human emotions and spirituality connect. The key to win over hearts and minds of the Tibetan people lies in connecting with the Dalai Lama. The state should have a bold vision in resolving the issue of Tibet through dialogue with Dalai Lama in order to ensure a stable environment where in the people of Tibet and China live harmoniously.